A black cross on a red heart, resting on a white Messianic Rose on a Field of blue, surrounded by a golden circle. First there is a black cross set in a heart of natural color to remind me that faith in the Crucified One saves us...This heart is mounted in the center of a white rose to show that faith brings joy, comfort, and peace... The rose is set in a sky-colored field to show that such joy of the spirit and faith is the beginning of the heavenly joy to come, present already in our joy now and embraced by hope, but not yet made manifest. The church is often represented by a ship. The main part of the church, which is called the NAVE receives its name from the Latin word "navis". It is also used in some churches to remind the worshipers that the church is a ship on the sea of life and that it sails unharmed through all perils. On October 31, 1517 Luther posted his 95 Theses against the abuse of indulgences on the main door of the Castle Church at Wittenberg. The practice of publicly announcing theses was an old custom in medieval universities, and the door that Luther used for his proclamation had been regularly employed as an academic bulletin board. To make sure that the theses would be widely understood, Luther had a German translation circulated among the people. With this the Reformation had begun. The three interwoven circles constitute a popular symbol of the Trinity. Each circle represents one of the persons in the Trinity. The circle has no apparent beginning or ending, signifying the eternal nature of each person in the Godhead. The three circles are intertwined, thus forming one design which symbolizes the unity of the eternal God as Father, Son and Holy Spirit. God the Father, is the Creator, revealed by Jesus Christ, operating in humanity as the Holy Spirit. The combination of the trefoil with the triangle emphasizes the eternity of the Trinity. Emblematic of the Trinity because of its threefold division. 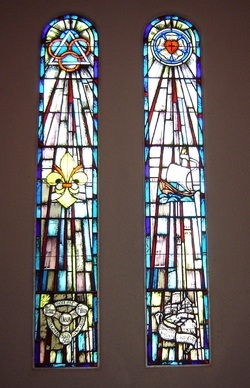 The Fleur-de-lis is also an emblem of the purity of the Virgin Mary. A geometrical symbol of the Holy Trinity. At the top of the left line is a circle enclosing the Latin word Pater for Father: the end of the right line has a circle enclosing the word Filius for Son: at the bottom of the triangle the words Spiritus Sanctus for the Holy Spirit. In the center is the word Deus for God. The unity of the Godhead is pictured by using the world est(is) on each line leading to Deus. Thus reading: "The Father is God; the Son is God; the Holy Spirit is God." The separate phases of the Godhead are pictured by the words non est (is not) written on other lines running from the Father to the Son, to the Holy Spirit; to the Father. Reading: The Father is not the Son; the Son is not the Holy Spirit; the Holy Spirit is not the Father.